Oh no! Is there something wrong in the Mushroom Kingdom? Is Bowser up to his dastardly deeds again? Because why else would sweet little Princess Peach jump out of a Nintendo video game this Halloween? Oh wait! It’s your little girl all dressed up in pink and ruffles and she looks so much like Princess Peach that it’s guaranteed to send a certain dashing, mustachioed Italian plumber will set off on a quest to rescue her and save her home. 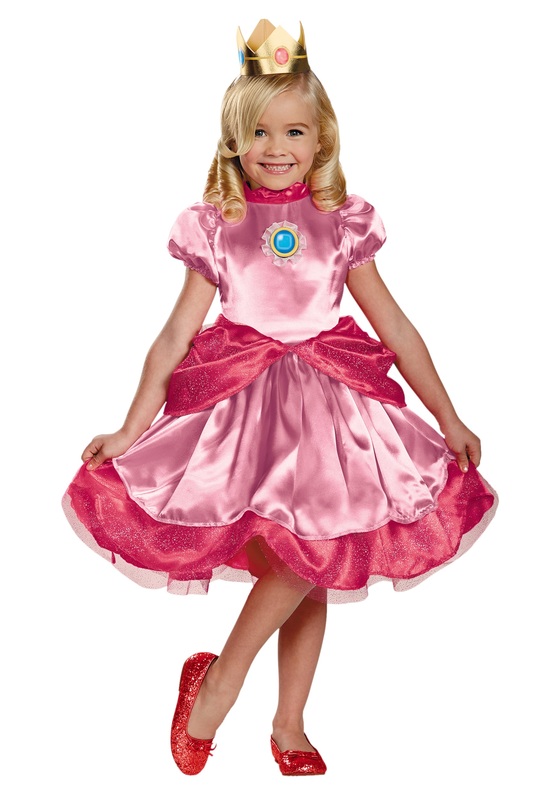 Our Toddler Princess Peach costume is officially licensed from Nintendo. That’s why the details are so perfect that everyone on her trick or treat route will have to look twice to make sure she’s not the animated damsel in distress from the game. From the tip of her crown to the bottom ruffles of her skirt, your little Princess Peach will make all the Marios out there trick or treating get a crush on her. Her pink satiny evening gown has frills at the trim beautiful, adorable puffy little sleeves, and a tiered ruffly skirt in two colors of pink for all the prettiness. A faux cyan jewel – just like Princess Peach’s signature gem – is replicated and attached to the costume. There’s even a tulle petticoat with a glittery satin hemline ruffle. And the crown looks like real gold, but it’s lightweight foam and attaches to a plastic headband with elastic loops. All your little Princess Peach needs is some red shoes (and maybe some long white evening gloves), and Mario won’t be able to miss her!